My basement used to be finished. It was where I’d set up my (mostly unused) TV and sent my cat at night so he wouldn’t spend hours yowling outside my bedroom door. That all changed in late April when, after some impressive weeks of “blizzard, melt, blizzard, melt,” it began to rain. The ground was still frozen and completely saturated, so where was the rain to go? I came home one afternoon to find a slow river running through a section of the carpet. The most obvious cause was water seeping in from around a pipe. After a trip to the hardware store, I filled up the cracks with plumber’s putty, vacuumed up gallons of water, and set out some fans and a dehumidifier. Problem solved. The next morning, however, the carpet was soaked from wall to wall. I moved out all but one piece of furniture and took up the carpet and padding, hoping to find where the water was coming in. The verdict? Cracks/holes in the foundation. The solution? Drain tiling and a sump pump. 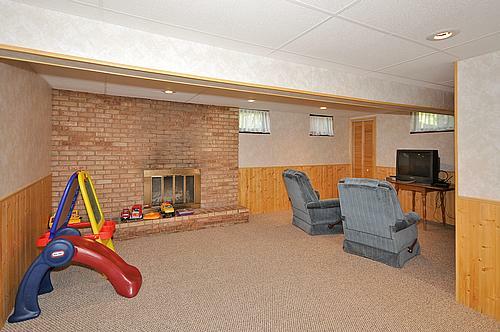 But before any of the contractors would do that, I needed to de-finish the basement. To save money, I decided to do it myself. It was a learning experience as well as an exploration of suburban archeology. In the end, my basement is dry and unfinished. A (mostly) blank slate. I decided that I wouldn’t refinish it for a few years, but what to do with it in the intervening time? While I enjoy writing, I’m an editor by trade, and after working all day on some of my recent projects, the last thing I want to do is come home and herd words. 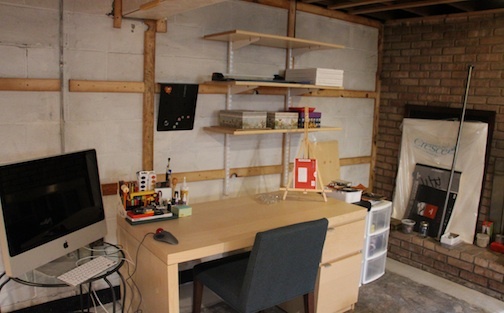 So I retire to my art cave, which I’m slowly building upon the old bones of the basement. Behold! Okay, so it’s not much to behold, at least not yet. But I have plans. Some of my plans involve making things to hold my art supplies, such as this three-section box with additional dividers made out of rubber bands and paperclips. …Of course, you can’t see the box. 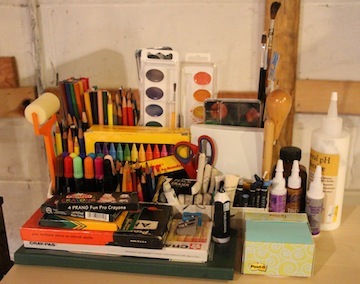 It’s full of/surrounded by art supplies!